First published in The Psychological Bulletin, 6, 257-273. About eight years ago Professor I. P. Pawlow, Director of the physiological department of the Institute of Experimental Medicine in St. Petersburg, devised and introduced into his great research laboratory an ingenious and valuable new method of investigating the physiology of the nervous system in its relations to the so-called psychic reactions of organisms. This method --- now widely known as the Pawlow salivary reflex method - has been extensively employed by Pawlow and his students in St. Petersburg. Recently it has been introduced into the Physiological Institute of Berlin by Nicolai, a former student of Pawlow. It consists in the quantitative study of those modifications of the salivary reflex which are conditioned by complex receptive and elaborative processes (psychic reactions) in the central nervous system. Inasmuch as practically all of the results of the method have been published in Russia, it has seemed to us important that a general description of the technique of the method, together with a statement of certain of the important results which is has yielded, should be published at this time in English. Our purposes in preparing this article were two: first, to present a body of facts which is of great importance to both physiologists and animal psychologists; and second, to familiarize American investigators with the salivary reflex method and hasten the time when it shall be as advantageously used in this country as it now is in Russia. The materials for this discussion we have obtained chiefly from six papers. Of these the first four are, in the main, general accounts [p. 258] of the method and its results from the strikingly different points of view and interests of Pawlow and Nicolai. The papers of Selionyi and Orbeli are admirable reports of facts. At the end of this article we present a complete bibliography of the subject to 1909. We are indebted to Professor Pawlow for a number of the titles included in this list and also for a thorough revision and correction of the bibliography. Our discussion naturally falls into four parts: (1) A general description of the method of its application, from the standpoints of Pawlow, Nicolai, and Selionyi; (2) an expository summary of the study of the auditory reactions of the dog as reported by Selionyi; (3) a similar summary of Orbeli's study of the visual reactions of the dog; and (4) a general summary of the results of the method. To give a complete account of the investigations of the St. Petersburg laboratory - for already more than forty papers have been published - would be possible only if each paper were dismissed with a sentence or two. We have preferred to consider two representative papers in some detail instead of mentioning several casually. DESCRIPTION OF THE SALIVARY REFLEX METHOD. It was Pawlow's idea that the perfectly constant and dependable 'unconditioned' salivary reflex might be used to advantage as a basis for the investigation of those complex nervous processes one of whose expressions is a 'conditioned' reflex of the same glands. Since many, if not all, changes in the nervous system gain expression in one way or another, through the salivary reflex, why not, Pawlow asks, investigate these processes by observing their relation to this particular reflex? That there was nothing novel in this idea is evident when we recollect that numerous reflexes have been used, by other investigators, for the study of psychic reactions. Respiration, heartbeat, and certain secretory changes have been studied, in this connection, with varying success. But what Pawlow may claim, apparently, is the discovery of that particular reflex which seems to be best adapted for the investigation of complex nervous processes. The experimental procedure is as follows. A normally active and healthy dog of vigorous salivary reaction having been selected, the duct of one of the salivary glands - the parotid for example - is exposed on the outer surface of the cheek and a salivary fistula is formed. The wound heals completely within a few days and the dog exhibits no signs of discomfort or inconvenience. Those who have used the method insist, indeed, that their animals are perfectly normal is all respects. In further preparation for the study of the salivary reflex a small glass funnel is fastened over the opening to the duct with Mendelejeff cement. To this funnel is attached a tube which conducts saliva to a graduate. Three methods of measuring the quantity of saliva secreted are in use. (1) As the secretion flows from the tube into a graduate the drops are counted, and if the experimenter so desires, an additional measurement may subsequently be obtained by readings from the scale of the graduate. (2) The saliva is permitted, as Fig. 1 shows, to flow through a short tube into a graduate bottle and the amount of the secretion is then determined by reading the scale on the bottle. This method necessitates the replacing of the partially filled bottle by a clean one and the careful cleaning of the funnel between experiments. (3) A small metal canula, inserted in the duct of the gland, is connected by a heavy walled rubber tube with a small glass tube. The saliva drops from this tube upon the lever of a Marey tambour, as shown in Fig 2. As it falls drop by drop upon this lever a record is made [p. 261] upon a smoked drum. From this record the experimenter may read the quantity of the secretion in drops and the rate of flow, i.e., how many drops fell in a given interval. This graphic method of recording the salivary reaction is Nicolai's improvement on the Pawlow method as used in Russia. In addition to enabling the experimenter to obtain more detailed and accurate data concerning the reaction, it has the important advantage of permitting him to withdraw from the experiment room during the experiments. This is desirable because his presence is likely to influence the dog in unexpected and undesirable ways. The Pawlow method lends itself readily to the investigation of many psychic reactions. In order to get clearly in mind the remaining essential points of experimental procedure we may consider its application to the study of visual discrimination of colors. A dog, which has been selected for observation and in which a salivary fistula has been created, is subjected to a course of training to establish a 'conditioned' reflex on the basis of visual stimulation. This is accomplished by showing the animal a particular color - say green - at intervals and at the same time giving it food. After numerous repetitions of this procedure the visual stimulus becomes the sign of food and induces the salivary reflex in the absence of the food. An animal so trained is ready for experiments on the discrimination of colors. If it appears that no color except green produces the 'conditioned' reflex, there is reason to believe that the dog perceives green as distinct from the other colors. Pawlow devised and employs this method not for the study of psychic phenomena, as Nicolai proposes to do, but simply as a means of approach to the physiology of the nervous system. Of his insistence upon the objective point of view the following quotation from his Huxley lecture is excellent proof. "Up to the present time the physiology of the eye, the ear, and other superficial organs which are of importance as recipients of impressions has been regarded almost exclusively in its subjective aspect; this presented some advantages, but at the same time, of course, limited the range of inquiry. In the investigation of the conditioned stimuli in the higher animals, this limitation is got rid of and a number of important questions in this field of research can be at once examined with the aid of all the immense resources which experiments on animals place in the hands of the physiologist...The investigation of the conditioned reflexes is of very great importance for the physiology of the higher parts of the central nervous system. Hitherto this department of physiology has [p. 262] throughout most of its extent availed itself of ideas not its own, ideas borrowed from psychology, but now there is a possibility of its being liberated from such evil influences. The conditioned reflexes lead us to the consideration of the position of animals in nature: this is a subject of immense extent and one that must be treated objectively." Although psychology - or rather psychologists - deserves all of the criticisms which the physiologists have made, students of animal behavior and comparative psychology should not allow Pawlow's attitude to discourage them. Nor should they be slow to appreciate the immediate importance, and promise for the advancement of their science, of the Pawlow method and its results. That is can be used to advantage by animal psychologists, as well as by those physiologists for whom the psychic phenomenon is merely an unescapable nuisance, is obvious. Already Nicholai has ably discussed the relations of the method to psychological problems. He contends, with reason, that the salivary reflex method possesses the four essential characteristics of a scientific method in psychology: (a) it is general, in its applicability to the study of psychic processes; (b) it is constant; (c) it permits accurate measurement; and (d) it is specific. Undoubtedly the method may be applied to the study of various aspects of sensation and the mutual relations of sensations, to memory and ideation, to the formation of judgments and will acts. Its obvious limitation appears in the number of organisms with which it may be employed. Evidently it can not be used for the study of animals which lack salivary glands, and even among those animals which do possess these glands there are many which surely would not lend themselves satisfactorily to the method. It seems, therefore, as if Pawlow's method were especially important in animal psychology as a means to the intensive study of the mental life of a limited number of mammals. The dog evidently is especially well suited to the experiments. SELIONYI'S STUDY OF AUDITORY REACTIONS. With this brief general sketch of the method and its purposes in mind we may turn to the investigation reported by Selionyi. In order, we shall state the problem, the principal points of method, and the results of his study of the auditory reactions of the dog. The initial purpose of the work was to determine, by means of one form of the Pawlow method, how great must be the difference in the quality or the intensity of two auditory stimuli in order that they [p. 263] shall produce perceivably different effects upon the auditory apparatus of the dog. The problem as it presented itself to the investigator was primarily one of the physiology of the nervous system, and secondarily one of animal psychology. Starting with the familiar fact that sounds which have been associated with food may under certain conditions stimulate the salivary reflex, Selionyi first of all, as a necessary preliminary to his research, attempted to ascertain whether certain unusual or unfamiliar sounds, as well as those which have become familiar through their association with food, cause the secretion of saliva. He discovered that only 'familiar' sounds - those which the dog has learned to recognize as significant - have this effect as a rule. No dogs were used for the investigation whose salivary reaction was not vigorous. An animal after having been tested for its normal reaction and prepared for the experiments by the creation of a salivary fistula, was trained until a definite 'conditioned' reflex appeared in connection with some particular sound. Repeatedly, in the training experiments, this sound was produced near the dog at the instant food was given. Sometimes the two stimuli were presented simultaneously; sometimes the sound preceded the food by five to thirty seconds. The combined action of the stimuli was permitted to continue for thirty to sixty seconds. This procedure was repeated at intervals of ten to thirty minutes, on a number of different days, until the sound, when given alone, would rapidly bring about the secretion of saliva. This usually occurred after twenty to forty repetitions. A particular sound - of definitely determined pitch, intensity, and quality - was thus rendered significant and 'familiar.' It now differed from other distinguishably different sound in that it had its specific salivary reflex, whereas they caused no reaction. 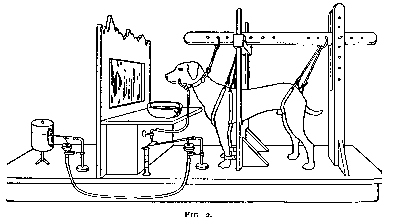 During these training tests it is extremely important, Selionyi points out, that the experimenter make no unusual movements or otherwise produce conditions which may regularly and markedly stimulate the dog, else these irrelevant stimuli may become associated with food and spoil the result of the training experiment. In all of the experiments the experimenter has to guard against irregularities of condition. If he moves too quickly or if he holds himself too rigidly quiet, as the inexperienced worker is likely to do, the dog is disturbed and the salivary reaction modified. A dog whose normal salivary reaction had been carefully observed and in which the habit of responding to a certain sound had been developed was placed in an apparatus similar to that of Fig. 2. The 'familiar' sound was then produced and the reaction noted. The experimenter took account of both the quantity and the quality of the saliva. A quantitative expression for the former was obtained either by counting the drops as they left the fistula or by measuring the secretion in a graduate. The quality (viscidity) was determined by a measurement of the rate of flow through a capillary tube. Some ten minutes after the 'familiar' sound, an 'unfamiliar' sound whose influence upon the reaction the experimenter wished to discover, was given in the same way, and the reaction was again observed. After another interval, the 'familiar' sound was repeated. Thus, for the purpose of comparison, the observer obtained reactions to both kinds of stimuli in rapid succession. The experimenter noted the interval (latent period) between application of a stimulus and the appearance of the first drop of saliva, and he collected and measured the saliva which was secreted between stimulations as well as immediately after the application of each stimulus. TABLE EXPERIMENT 54. 'MARGARET.' Familiar sound, A, of Tuning Pipe. Unfamiliar sound, A, of Tuning Pipe and 'Rattling' Whistle. Time. Sound. Duration of Stim. Quantity of Saliva in Drops. In order to render a translation of Selionyi's summary of results intelligible it will be necessary to define a number of the terms which he employs. A 'familiar' stimulus (sound, in this investigation) is one which experience has taught the animal to respond to as if it were the precursor of food. It is in fact a sound which produces a 'conditioned reflex' ordinarily. An 'unfamiliar' stimulus is one which the animal has not been trained to respond to. A 'fundamental reflex' is one which is caused by a 'familiar' sound. An 'additional reflex' is one which is caused by an 'unfamiliar' sound which differs from the 'familiar' sound only in pitch. A 'partial reflex' is one which is caused by some part of a complex 'familiar' sound. As, for example, when one tone of a 'familiar' chord causes a reflex. In reading the summary of Selionyi's results it is important that the reader remember (1) that conditioned reflexes die out with repetition. (2) That edible subtances, [sic] when used as stimuli repeatedly, produce a constantly diminishing secretion of saliva, whereas inedible substances, when used repeatedly, produce a constantly increasing secretion. (3) That the secretion in response to edible substances increases as the interval between stimuli is lengthened, whereas the secretion to inedible substances diminishes as the interval is lengthened. Selionyi states that he made use mostly of edible substances. He did, however, at times make use of weak acid solutions as a substitute for food. 2. Sounds which differ from one another only very slightly in quality are received as distinct stimuli. 3. A conditioned reflex of definite intensity is specific of (results from) a sound ('familiar') of a given pitch which has become its stimulus. 4. 'Unfamiliar' sounds which differ from the 'familiar' sound by a slight variation in pitch, produce in some dogs 'additional' reflexes which are much less intense than the reflex to the 'familiar' sound. 5. Even comparatively slight changes in the quality of 'familiar' sounds result in a diminution and disappearance of the fundamental salivary reflex. 6. Sounds which differ from one another very little in pitch (the quality and intensity remaining constant) may become the stimuli for the secretion of saliva of different degrees of viscidity: some cause the flow of liquid saliva; others, of viscid saliva. 7. The specificity of conditioned reflexes for the sounds which induce them may persist for two months. 8. Diminishing the strength of the 'familiar' sound causes the weakening or even the complete disappearance of its conditioned reflex. 9. A 'familiar' sound, which very gradually reaches such an intensity that a conditioned reflex would ordinarily result from it, fails to call forth its reflex if it was too weak at the beginning. 10. Separate components of a complex sound which conditions a 'fundamental' reflex, will produce reflexes (the so-called partial reflexes) at a certain relative intensity. 11. The intensity of partial reflexes depends upon the relative intensity of the sounds by which they are induced. The more intense the partial sound, the stronger is the partial reflex. A single tone of a familiar chord of three tones, of the same quality and intensity, produces a less intense partial reflex than do two tones of the same chord. 12. Each partial sound has its specific partial reflex just as each 'familiar' tone has its fundamental reflex. 13. The substitution of an irrelevant tone for one element of a 'familiar' chord tends to inhibit the reflex. 14. The addition of an irrelevant sound to the 'familiar' sound tends to inhibit the conditioned reflex. 15. The degree of inhibition is directly related to the intensity of the new or inhibiting sound. 16. Simultaneous stimulation by two sounds, each of which produces, when alone, the conditioned reflex (in connection with a non-conditioned reflex which is induced by the same food substance) brings about different results according to the character of the sound. In some cases the reflex which is thus produced is equal in intensity to the reflex caused by one of the two sounds; in other cases it is of considerably less intensity. 17. Under certain conditions of excitability or permanency, a conditioned reflex which has been worn out by repetitions may spontaneously reappear at the end of the interval which separated the previous repetitions. 18. The statement that a worn-out conditioned reflex may be restored by any unconditioned stimulus must be recognized as false. 20. The wearing out of an 'additional' reflex causes a slight weakening - in an acute experiment - of the fundamental reflex with which it is associated. 21. The wearing out of a fundamental reflex - in an acute experiment - causes a complete loss of the additional reflex which is associated with it. 22. The wearing out of a partial reflex - in an acute experiment - causes some weakening of the fundamental reflex. 23. The wearing out of one partial reflex causes the wearing out of another of the same intensity as the first. This phenomenon is observable in an acute as well as in a chronic experiment (at least in those cases in which the partial sounds are of the same quality). 24. By subjecting additional and partial reflexes to wear by repetition in a chronic experiment, and by simultaneously reinforcing the fundamental conditioned reflex by means of a non-conditioned reflex, it is possible to destroy completely the additional and partial reflexes while retaining the fundamental reflex in its full original intensity. 25. The independent restoration of two partial reflexes which have disappeared in a chronic experiment by reason of the repetition of one of them comes about differently. At the time when the partial reflex which was subjected to the influence of repetition has not yet reappeared the other partial reflex is fully expressed. 26. 'Unfamiliar' sounds which differ from a 'familiar' sound only very slightly in pitch, when given before the 'familiar' sound tend to inhibit its reflex. 27. A 'familiar' sound, the conditioned reflex of which has been worn out, produces an inhibitory effect upon the unworn reflex of another 'familiar' sound, when it is given simultaneously with the latter sound. ORBELI'S STUDY OF VISUAL REACTIONS. This investigation embraced five important phases of visual stimulation: (1) Color perception; (2) brightness perception: (3) size perception; (4) form perception; and (5) movement perception. The author's description of his method is not sufficiently precise and detailed to furnish the reader with adequate information. In presenting Orbeli's results concerning the sense of vision in the dog, it seems fair to remark that they are not as precise and as valuable quantitatively as might have been obtained by the employment of more accurate and refined methods of stimulating the animal. The importance of Orbeli's conclusions with reference to the visual capacities of the dog is so great that we herewith offer a translation of the summary with which his interesting paper ends. 1. A study of conditioned salivary reflexes furnishes no indication that rays of light of different wave-length are received as distinct stimuli by the eye of the dog. Conditioned salivary reflexes are always determined by changes in the intensity of light independently of its composition (quality). 2. A conditioned reflex may be produced by either increasing or decreasing the general illumination, and by the appearance of light figures on a dark background, or of dark figures on a light background. 3. Conditioned reflexes resulting from optical stimulation are essentially dependent upon the intensity of the photic stimulus. (a) In many instances the importance of the intensity of the light becomes apparent quickly, for a much greater secretory effect results from a stronger stimulus. (b) In the case of a certain degree of sensibility in a dog, even weak photic stimuli may produce so great an effect that more intense stimuli will not produce a greater reaction. (c) Strong photic stimuli may bring about a pronounced reaction even when a weak stimulus has lost its influence by repetition. 4. The intensity of a photic stimulus depends not only upon the degree of change in light intensity, but also upon the size of the illuminated or shaded are. These two factors may compensate for one another. 5. Visual conditioned reflexes show clearly that it is characteristic of nervous tissue to respond more actively to an intermittent stimulus than to a continuous one. 6. Conditioned reflexes indicate that it is characteristic of the nervous system to enter upon a condition of excitability at the moment of the application of the stimulus, and to respond to brief single stimulations by a continued reaction. The tendency to react in this manner is especially marked, in the formation of a conditioned reflex, when the beginning of the photic stimulation coincides exactly with the beginning of the unconditioned reflex. 7. Qualitative [it is to be noted that this does not refer to color] differences in photic stimuli are determined not only by the fluctuations of the intensity of the light, but also by the specific grouping of the illuminated and the dark retinal elements (i.e., by the form of objects). (a) Early in the formation of a reflex the significance of form is indefinite and the reflex is determined wholly by the appearance of a light or a dark figure. (c) It is possible, in a short time, to produce a marked difference in the influence of two figures by systematically weakening the reflex to the unfamiliar figure and by reinforcing the influence of the familiar figure by the use of food. (d) Rendering different the influences of a familiar and an unfamiliar figure produces conditions which greatly favor the improvement of discrimination of the familiar from the unfamiliar figure. Under these circumstances unfamiliar figures retain their independence to a certain extent. (e) The different effects produced by various figures depend not upon quantitative differences (intensity of light), but upon qualitative differences, that is, upon the unequal or dissimilar grouping of simultaneously stimulated retinal elements. 8. When a difference in the effects of a familiar and an unfamiliar figure has been established, intensification of light, increase in the area of the figure, and repetition of the stimulus do not increase the effect produced by the unfamiliar figure. 9. When a difference in the effects of a familiar and an unfamiliar figure has been established, and the unfamiliar figure produces only a slight effect, its influence may be considerably increased by the introduction of irrelevant stimuli. 10. 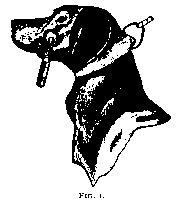 Moving objects may act upon the eye of the dog as distinct stimuli. In this case the direction of movement may determine the qualitative difference of stimulation and modify the reaction of the dog. (a) In the early stages, after a conditioned reflex to movement has been established, the direction of the movement is not important and a familiar direction will have the same effect as an unfamiliar direction of movement. (b) A distinct difference in the influence of movements varying in direction may be produced in a short time (by the process of wearing out the reflex to one stimulus by repetitions, and of reinforcing the other by giving food in connection with the stimulus). 11. The differences in the effects of different figures, and of movements of various direction, is apparently based upon the establishment of a conditioned inhibition. Stimulation of some regions of the retina establishes among the various groups of retinal elements the same sort of relation which obtains between the separate receptors of the entire organism. LAWS OF CONDITIONED REFLEXES AND CONCLUSIONS CONCERNING THE RELATIVE IMPORTANCE OF THE SENSE OF THE DOG. The work in Pawlow's laboratory has rendered it possible to formulate a number of laws concerning the conditioned reflex. We shall mention only three of the most important of these, as examples. Law I. A conditioned reflex can be worn out or destroyed by repetition of its conditioning stimulus or stimulus complex. Whereas at first a particular sound, sight, or odor which is indicative of food causes the secretion of several drops of saliva, after a few repetitions at short [p. 270] intervals and without the presentation of food to the dog it causes no secretion. This wearing out of the conditioned reflex serves to distinguish it from the unconditioned reflex. Law II. The destruction of a conditioned reflex by repetition does not influence other conditioned reflexes. For example, the wearing out of the conditioned reflex to the sight of a particular kind of food leaves unmodified the reflex to the odor of the food. Law III. Irrelevant stimuli (a sudden noise, a new object in the environment, etc. ), produce a depressing effect upon conditioned reflexes. In regard to the nature of their influence, they may be conveniently classed in two groups: (1) those that temporarily diminish or even suspend the activity of the conditioned reflex, but lose this retarding effect after a few repetitions; (2) those which at first tend to reduce the intensity of the reflex and finally inhibit it completely. Many other laws of importance for investigators who wish to make use of the salivary reflex as a means of studying animal behavior are to be found in the various papers mentioned in the bibliography at the end of this article. 1. Cold, which when applied to a particular spot on the skin in the dog calls forth a conditioned reflex, has a like effect when applied to another region of the skin. Localization apparently is not precise. 2. Mechanical stimuli, which when applied to a particular region of the body cause conditioned reflexes, do not have this effect when applied to other regions. In this case localization is fairly precise. 3. Warmth stimuli are distinguished by the dog from cold stimuli and both of these are distinguished from mechanical stimuli, such as tickling, scratching, rubbing. 4. The dog's hearing seems to be very well developed. To markedly different tones or noises specific salivary reflexes are given, after training. But when a sound differs only slightly, in pitch for example, from the 'familiar' tone it may cause merely a quantitative change in the reaction. If to a particular 'familiar' tone a dog reacts by the secretion of ten drops of saliva, to one a quarter of a tone higher it may respond with only eight drops, to one a half tone higher with four drops, to one a full tone higher with only one drop, while greater differences may cause no visible reaction. 5. Nicolai, like Orbeli, has failed to obtain evidences of color vision in the dog. Of the difficulties and dangers of error in the investigation of this subject the following observation is a significant indi- [p. 271] cation. Nicolai discovered that a dog which was apparently able to distinguish green from red was in fact depending for its means of discrimination upon a slight difference in the action of the two different keys which were used to give the stimuli. Color had nothing to do with the reactions. For the human observer the stimuli which served to control the behavior of the dog were practically imperceptible. Evidently, visual stimuli which effect us very differently are the same for the dog; whereas certain other forms of stimulation which are for us insignificant are readily distinguished by the dog. 6. We obtain no quantitative expression of the value of the brightness, size, form, or movement perception from the papers on the visual reactions of the dog, but the presence of these several kinds of visual ability is demonstrated. 7. Two stimuli may be compared as to intensity (stimulating value) by comparison of the amounts of saliva which they cause to be secreted. 8. Comparison of stimuli of different sense modes indicates that the following is the order of diminishing importance for the dog: Smell, hearing, cutaneous sense (mechanical stimuli), vision, temperature senses. The dog is preëminently a nose-animal. Indeed, so acute is the sense of smell that it has thus far proved impossible to study it to advantage. Our color vision may enable us to teach the dog to distinguish colors, but he is in a position to give us instruction in smelling! Finally we may be permitted to quote from Nicolai his conclusions concerning the relation of the Pawlow method to animal psychology. "The Pawlow salivary reflex is a relatively complicated process which is connected only indirectly with the exciting stimulus and for the occurrence of which the idea of eating is always necessary." "Pawlow's salivary reflex method gives us a better explanation of the manner in which a dog learns spontaneously [than do most other methods], but it remains to be shown how far the learning can be carried. In the solving of related questions, the method does not seem to be superior to Kalischer's training method, and the latter is much the more convenient." "One can show experimentally that a dog learns by subsuming certain new ideas under general ideas which he has already acquired in the course of the experiment." 1. Pawlow, J.P., 'Sur la sécrétion psychique des glandes salivaires (Phénomenes nerveux complexes dans le travail des glandes salivaires).' Arch. intern. de physiol., T. 1, pp. 119-135, 1904. 2. Pawlow, J.P., 'The scientific investigation of the psychical faculties or processes in the higher animals' (The Huxley lecture, 1906). Lancet, 1906, pp. 911-915. The lecture is reported in part in British Med. Jour., 1906, pp. 871-873, and in Science, N. S., Vol. 24, pp. 613-619, 1906. In justice to Professor Pawlow, it should be stated that Lancet alone gives the reader an adequate knowledge of the structure and materials of the address. It is deplorable that neither the British Medical Journal nor Science states that the lecture is published in condensed form. 3. Nicolai, G. F., 'Die physiologische Methodik zur Erforschung der Tierpsyche, ihre Möglichkeit und ihre Anwendung.' Jour. f. Psychol. und Neurol., Bd. 10, S. 1-27, 1907. 4. Nicolai, G. F., 'Das Lernen der Tiere (auf Grund von Versuchen mit Pawlowscher Speichelfistel).' Centralblatt f. Physiol., Bd. 22, S. 362-364, 1908. 5. Selionyi, G. P., 'Contribution to the study of the reactions of the dog to auditory stimuli.' Dissertation, St. Petersburg, 1907. Pp. 125 (in Russian). 6. Orbeli, L.A., 'Conditioned reflexes resulting from optical stimulation of the dog.' Dissertation, St. Petersburg, 1908. Pp. III (in Russian). Throughout this discussion we shall deal only with the dog, in as much as it has been used for all of the Russian investigations. According to Nicolai a mixed race of hunting dogs has been used in most instances. Conditioned and unconditioned are the terms used in the only discussion of this subject by Pawlow which has appeared in English. The Russian terms, however, have as their English equivalents conditional and unconditional. But as it seems highly probable that Professor Pawlow sanctioned the terms conditioned and unconditioned, which appear in the Huxley Lecture (Lancet, 1906), we shall use them. Centralb. f. Physiol., Bd. 22, S. 364, 1908. Nicolai, G. F. Die physiologische Methodik zur Erforschung der Tierpsyche. Jour. f. Psychol. und Neurol., Bd. 10, S. 1-27. 1907. Nicolai, G. F. (und Dr. Baudouin). Das Lernen der Tiere (auf Grund von Versuchen mit Pawlowscher Speichelfistel). Centralblatt f. Physiol., Bd. 22, S. 362-364, 1908. Pawlow, J. P. Sur la sécrétion psychique des glandes salivaires. Arch. intern. de Physiol., T. 1, 1904. Pawlow, J. P. The scientific investigation of the psychical faculties or processes in the higher animals. Huxley Lecture for 1906. Lancet, 1906, pp. 911-915 (published in full); also British Medical Journal, 1906, pp. 871-873 (in part); also Science N. S., Vol. 24, pp. 613-619, 1906 (in part). Tolotchinoff, J. Contribution à l'étude de la physiologie des glandes salivaires. C. r. du congrès d. natural. et med. du Nord à Helsingfors, 1902.